Grief-stricken shanty singers The Fisherman's Friends are to release their first new material since the death of group member Trevor Grills at a concert venue in February. The Cornish-based vocalists' second album, One and All - the follow-up to their eponymous debut long-player - was recorded days before Grills was killed, along with band promoter Paul McMullen, at the G Live venue in Guildford, Surrey. The singers have only performed once since the tragedy, at Grills' funeral service, and say all future tour dates have been shelved for the rest of the year while the group considers its long-term future. In an interview with the Press Association in Port Isaac, where The Fisherman's Friends were discovered by a record company executive on holiday in the county, singer Jon Cleave said One and All would be dedicated to his friend's memory. He also described how he felt hearing Grills posthumously taking the lead on Mary Anne, the first single to be released from the new record. The 54-year-old said: "Trevor's voice is very sweet, it had a peculiarly individual quality of its own. "When you hear that now, it's a very emotional thing for all of us. Even if we sought to replace him with another singer - which we don't plan to - we would never find a voice like that." The new collection of 14 songs was originally due to be released at the end of March, with a video for Mary Anne filmed three weeks before the tragedy. 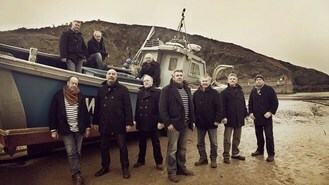 Cleave said the band members had been "absolutely overwhelmed and astonished" by the support from fans across Cornwall and around the world, with many urging The Fisherman's Friends to continue in Grills' honour. "It's been very heartening to know people want us to sing again," he said. "I hope we sing again, that's my personal hope. I think we will get into a place where eventually we can. "Although we will never get over the whole thing, I think we will be able to do it, and when we do it will always be with due regard for what we did before Trevor." Mumford and Sons have said that they plan to take to the Glastonbury stage for business as usual despite bassist Ted Dwane's recent operation to remove a blood clot on his brain. Rock band Heaven's Basement have revealed they waited so long to release an album because they had set themselves such a "high bar". Jay-Z is giving away a million downloads of his new album - but they will not be counted by Billboard, it has been announced. Miley Cyrus has revealed that she feels "disconnected" from her past hits. Robin Thicke has waded into controversy with his chart-topping single Blurred Lines, after critics described the track as "degrading to women". The Clash are to be given an honorary award to recognise their contribution to the music industry at the Silver Clef Awards. Music fans will be able to watch an hour of The Rolling Stones' headline set at Glastonbury on TV after a compromise was reached in a row over coverage of the set. Justin Bieber has revealed he is "focused" on the music, after being involved in a car accident.